Shopping carts are software or ecommerce applications that function as an online shopping basket. Typically, it works as an interface between the company’s website and its infrastructure; enabling the consumers to choose, review, make necessary additions, accumulate and finally, purchase the merchandize. The application also automatically calculates the total cost of the merchandise, including the costs of handling, shipping and its associated taxes, when applicable. What shopping carts does InMotion support? An open source and easy to use program that is recognized as one of the best solutions in creating online stores. PrestaShop supports payment gateways such as Google Checkout, PayPal, Skrill, Authorize.Net, and DirecPay as well as support international online stores, multiple shop and inventory management and taxes. Another open source ecommerce and online store-management application that can be used on any web server that has MySQL and PHP installed. A PHP based shopping cart that is easy to setup and is highly recommended to selling online. It has multiple category modes and is a completely customizable ecommerce tool. Designed to run on servers that have PHP and MySQL support, the CubeCart is a tool that is designed to help quickly setup powerful online stores. Another open source shopping cart that is PHP-based and is well known as a user-friendly, robust and powerful shopping cart solution. How can I setup a Shopping Cart on InMotion? 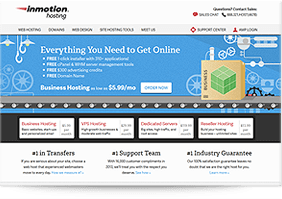 Installing and setting up a Shopping Cart software on InMotion is a simple and easy process with the use of InMotion’s built in Softaculous, in important tool found in the cPanel. Here are a few easy steps that you need to follow in order to setup your shopping cart software on InMotion. These steps should work to any, if not all, of the applications that you wish to install in your InMotion hosted account. Click on the program you wish to install. You can find the available programs to install from the categories on the left menu. For this specific case, look for the shopping cart software that you wish to install. Click on “Install” button which is usually located above the software description. You may need to fill in the necessary installation details and then again click the “Install” button. Is setting up a shopping cart vital for my website? Shopping carts are vital applications and a must-have feature for your website especially if you run an online store or an ecommerce website. Simply stated, an online store without a shopping cart application is simply an indication of that site’s future failure. Aside from the fact that shopping carts are vital for the merchandise selection, purchase and check-out process, it also brings a lot of advantages both to the customers and to the ecommerce business and the owner itself. Among these advantages are that it helps keep and organize shopping statistics and analyses as well as help maximize your site’s SEO. On the other hand, shopping carts help provide a safe and convenient shopping experience to your website’s clients. This advantage is what makes online shopping a big hit today as it allows the handling of the transaction and payment process a lot easier and faster.